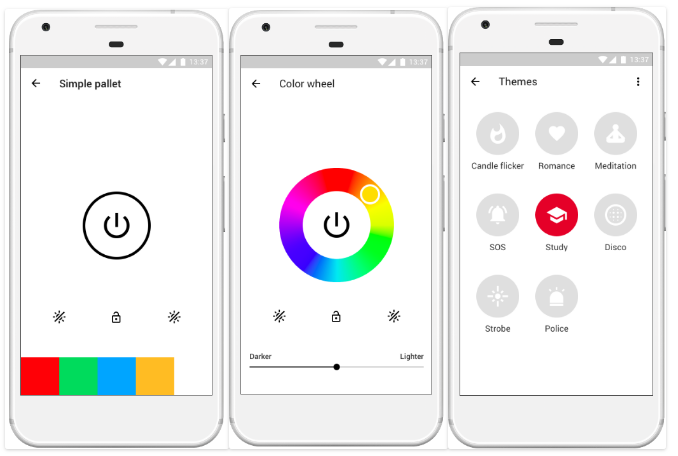 Starting off with providing an array of different colours, the module lets you pick and choose the colour and brightness of your light. Useful as a night light, a torch or a colour picker, it quickly becomes a very handy tool. The other exciting feature we have introduced is Moduware Moods. Our team has created set lighting displays for different moments in your life so that you can match the vibe with the right light. Calm yourself and build the feng shui with the candle flicker, romance and meditation modes. Start the party with our strobe and disco settings which are great for kids sleepovers throwing their own exclusive party with family and friends! We have added two entertainment moods with SOS and police. Just in case you are castaway on a deserted island or decide to become a vigilante (who wouldn’t want to be Batman?!?). You can also get creative and customise your own lighting mood. Play around with speed, variation and color range so that you can control the mood in your own home. We’re also working on an interface to allow you to create your own custom themes and share it with others. With a variety of interesting features and use cases, we expect the LED module to be a smash hit with lots of families!